ups: Info about some of the most popular PSP peripherals and other consumer electronics. downs: Terrible tutorials, advocates store-bought solutions over DIY solutions, clearly not an expert on the PSP. The PSP hacking scene is difficult to keep a handle on, even as a web-based magazine, where we can publish articles regularly covering the latest development. In the past month several new tools and utilities have come out that any PSP enthusiast has already read about on any one of a number of good PSP hacking, mod and homebrew websites. So when GF! received two new books about hacking the PSP, we were skeptical that they could possibly be as good as a quality website, but hoped they could at least be more detailed, better organized, and feature more helpful illustrations for some of the basics of PSP hacking. We first looked at Dave Prochnow\'s PSP Hacks, Mods and Expansions. Boasting on the book\'s cover includes both a \"Money Saving Coupons\" emblem and a laundry list of tips that begins with \"The Top 10 UMD Movies\" and \"Which Are the Top 10 Games Worth Buying?\"
From the outset, I\'m conflicted about this book. On the one hand, I\'m familiar with Dave Prochnow\'s writing for Make Magazine, his Robosapien hacking guide and other articles he\'s written. So I naturally wanted to enjoy PSP Hacks. Unfortunately, in this case you can judge a book by its cover: This book is actually just a shill to sell users on certain peripherals and full of (mostly) empty observations and half-assed how-to articles. In short, this is a text best avoided, and there are other books out that are much better (including the aforementioned second book we got in for review, Auri Rahimzadeh\'s Hacking the PSP). How could a book published a scant nine months after the release of the system claim to give you the top 10 games worth buying? Only one PSP game (Lumines) even scores an aggregate above 90% on GameRankings.com, a longtime friend to GamesFirst! and a reviews indexing meta-site. Many of the games Prochnow lists were not out in America at the time of the book\'s publication, and the list includes such stinkers as Rengoku, which scores an average of 47% on GameRankings.com. The kicker, of course, is that Rengoku was released on April 26, 2005, well in advance of the publication of Prochnow\'s book. Thus, there\'s no reason he should have included a mention of that game except in the \"games to avoid\" list. (But that list doesn\'t exist.) The icing on the cake is that the list contains two games that are still not available: Konami\'s Ys: The Ark of Napishtim is not scheduled for a release until late Spring or Summer of 2006, and Theseis, in development by Track 7 Games is mentioned nowhere else online for PSP. The only info we could dig up on Thesies says it is either in development for PC (according to the Track 7 Games website) and/or Xbox 360 (according to GameSpot). So Prochnow\'s exclusive information still outpaces the developer\'s website. The point of going into this is to describe the depth to which this book is not useful, not well-researched, and not worth purchase. At every turn the book makes similarly unexplainable turns of logic or instruction. Some of the \"mods\" are incredibly ugly and totally obvious. For example, three and a half pages are dedicated to images and text describing how to enhance your PSP using EL lighting tubes. Prochnow suggests purchasing a three foot length of EL tube, which is connected to a battery pack, then to squish the battery pack into an add-on PSP grip and run the EL wiring underneath a semi-transparent PSP protector. Where can you get those items? Prochnow suggests Boxwave, which makes the two items as a set-- the EL lighting battery pack is small enough to fit into the grips of the Boxwave PSP Action Grip and the Boxwave PSP FlexiSkin. If a company makes two products that are made to go together, then using them to help a third product make your PSP look like a jank Xmas tree is not a hack or leet modification. It\'s like saying, \"Check out my sweet iPod Nano travel case-- I call it a coin pocket.\"
Immediately after the EL lighting tutorial, two and a half pages (one page less than required for EL lighting) are dedicated to installing LEDs under the shoulder buttons of your PSP. This is one of the few ideas that has any merit in Prochnow\'s book, but the \"tutorial\" is so vague that one suspects that in order to follow Prochnow\'s directions here he would have to already know a lot about installing LEDs in consumer electronics. My final example of how bad these tutorials are will be the \"How to build your own USB PSP charger\" photo-spread, which features five photos on two pages. The first image shows the ends of a USB-B cable (the little one that plugs into the PSP), a USB-A cable (the big one that plugs into a PC), and a PSP charger cable. The idea is to make a single cable with three ends: One end plugs into the PSP\'s USB port for synchronizing, the second end plugs into the PSP\'s power port for charging, and the third end plugs into a PC. The three-headed cable would allow PSP owners to simultaneously synchronize their data and charge the PSP\'s internal battery. The second image shows the cut end of an unknown cable and reminds you to be careful about heat-shrinking protective tubing around wire connections. The third image shows another Boxwave product: The miniSync cable, which is a three-headed USB/charging cable for PSP. The fourth image shows the Boxwave product again, but this time the cords of the cables are longer, showing off the retractable cord caddy attached to the Boxwave miniSync. The fifth image shows a PSP plugged into a laptop computer using the Boxwave miniSync. So my question is: What happened to the cable we were going to build? I\'m sitting here with three cords all chopped up and nowhere to go, Mr. Prochnow. Other highlights of the book are when Prochnow walks you through the arduous task of applying Gamer Graffix decals to your PSP (coupon in the back of the book), and a photocopier-ready template for making your own Logitech PlayGear Pocket inserts. Of course, there are free packages that will help you do the same thing to print out of your printer, and there are much better tutorials about modifying the PlayGear Pocket in ways that aren\'t even mentioned (such as this tutorial about how to add slots to carry memory sticks in your PlayGear Pocket). Skip this book and move directly to either a good PSP hacking website, like PSP Updates or PSP Brew, or a much better book, like Auri Rahimzadeh\'s Hacking the PSP. In the world of PSP hacking and modification, things move too quickly to be bogged down in print. 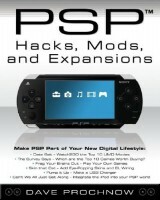 PSP Hacks, Mods and Expansions by Dave Prochnow is an example of just how behind-the-times a tech how-to book can be.